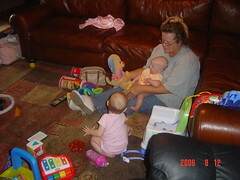 Kerstyn had a great time playing with Cali and Gramma on Saturday. Kerstyn is trying to give Cali a block to play with. These two little girls will be able to play hard in just a few short months!